THE SPORT of beach tennis is set to flourish with the news that Tennis South Africa (TSA) and KIA Motors have partnered to launch a high-profile International Tennis Federation (ITF) event circuit in December 2018. Life is a beach. KIA marketing director David Sieff (left standing) and some of the athletes following the announcement of KIA Summer Slam beach tennis tour. 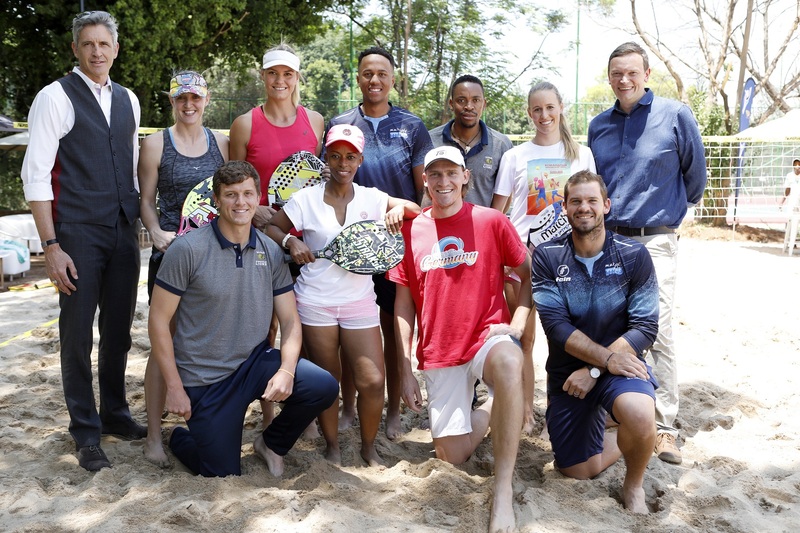 The partnership announcement and press launch of the KIA Summer Slam beach tennis tour was supported by athletes from other sporting codes, including Erin Burger and Lenize Potgieter from SA Netball; Wihan Lubbe and Aaron Phangiso from bizhub Highveld Lions as well as Grant Thomson and Wandile Makwetu from Multiply Titans. Spanning two weeks, the four events that make up the KIA Summer Slam beach tennis tour will all be ITF ranking tournaments and, coupled with a total prize money pot in excess of $35 000, the crowds will witness some of the world’s best beach tennis players on the South African shores. The final event, in Plettenberg Bay, will be one of the five richest beach tennis events in the world in terms of prize money. “We are delighted to see KIA Motors extend their support of local tennis with this exciting new three-year partnership. We have built up a great working relationship around their Davis Cup team sponsorship and their involvement in beach tennis promises to be even more exciting,” says TSA CEO, Richard Glover. Over and above the high-profile December events, the new partnership will also see beach tennis courts being built at existing TSA Growthpoint development centres – in Soweto, Atteridgeville, eThekwini and Cape Town, respectively. David Sieff, Marketing Director, KIA Motors South Africa is excited to extend the involvement of KIA Motors in tennis. “KIA Motors has a longstanding association with tennis globally through the Australian Open, but also locally through our association with Team South Africa and Davis Cup,” he says. 8-10 December 2018: St Francis & Cape St Francis Prize money: $2500. 12-14 December 2018: Knysna Prize money: $2500.